So it’s finally beginning to feel like Spring and what better way to celebrate the beautiful weather than a shopping trip! It also meant we could finally take our photos outside (well in our garden but close enough)! 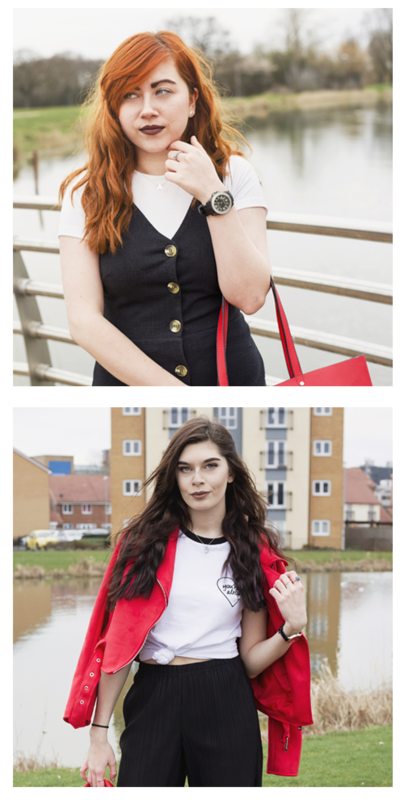 Here are some of the clothes we’ve bought recently so we can finally swap the jumper and jeans for a summery dress! We’re loving floral patterns this spring and you’ll definitely notice that in this post! So I realised a lot of the clothes I wear aren’t really spring/summer clothes and so I decided it was finally time to get some! Everything I bought is black but nearly all of it has flowers on it so I’m getting there! I got most of it from H&M. They do really lovely stuff but it’s quite difficult to find the nice clothes in our local store as they’re usually hidden! You have to have a proper good look to find all the stuff we got! The first thing I got is this skirt. At first I wasn’t too amazed but Lauren is always pressuring me to try stuff on! “Just try it on, you might like it better on yourself!” Well I guess she was right! I love the little black buttons on the front, it’s different doing buttons up on a skirt rather than just pulling it up and letting the elastic do its thing. But it adds a nice little touch! I also like how pretty and girly it is yet it’s still black! Probably not your idea of ‘spring fashion’ but for me it’s close enough! This is almost like the skirt in dress form! I love how it fits because it’s not too tight and quite flowy. I only really wear this style of dress because it’s not too short but not too long. It goes really well with black tights but I can imagine it will look quite nice without in the summer! I don’t really like showing my arms off so I do love a good long sleeved shirt, I just wish they suited me more! This one is slightly more girly than others that I own with its floral pattern. It also matches my rose DM shoes, yay! Shirts can look as formal or as casual as you like so they’re such a good item of clothing to have in your wardrobe! They do this top in lighter colours but I chose black (obviously) because it just goes with everything! I love the pattern and it’s just something different for me really! I like how it’s slightly cropped as I’m not really confident when it comes to showing my stomach off! It goes with high waisted skirts, shorts and jeans and the pattern is quite simple so it doesn’t take the attention away from my skirt. Since I change my preferred style of shorts every single year, I literally have no shorts for the summer. I thought I’d survive with dresses and skirts but when you don’t want to look ‘too dressy’ it’s a good idea to have a nice pair of shorts! These ones are high waisted (although since I’m quite tall I don’t really think they look it) and I love the kind of distressed/washed out look to them. I don’t like wearing shorts without tights so I got myself some cheap thin ones from Primark! I love how you can add them to shorts to get a grunge sort of look! It’s finally getting to that time of year where you don’t have to wear a 1,000 layers to keep warm! So most stores have their Spring/Summer stuff out now and I’m super excited that I get to wear some bright florals and pastels. I have recently bought these pieces but I doubt I’ll stop there as I have a few more shopping trips planned over the next few weeks! EEEEEEK FLORALS! Not super bright but I thought this skirt can be worn through Autumn and Winter too (see I’m thinking ahead!). I’m a massive fan of the skater skirt through all seasons so I’m excited to wear this and style it in different ways. Also you get student discount in New Look so I got 10% off the £12.99 that it was priced as so I had to take this beauty home with me! I instantly fell in love with this dress and the pattern. I didn’t own anything in this style and wasn’t sure if the ruffle would suite me but it’s good to try new styles. They also sell this dress in white floral and I’m now regretting not buying both so I might head back at some point to see if I can pick that up too! This is from the H&M Coachella collection, all the pieces were so beautiful and made me want to jet off to America. This was my favourite piece I’ve bought in months. I’ve been wanting a cut out top for so long and I know Topshop do some but I’m not sure on how they’re cropped and quite see through. When I saw this at the front of my local New Look I knew it had to come home with me. I don’t own anything this colour in my wardrobe so I thought I’d change it up for this Spring! Also can I just point out these lovely shoes from Primark for £10 I posted a picture on our Instagram a few weeks ago. I’m not usually a shoe kinda girl unless they are Dr Martens so again I thought I’d try a new style of shoe for a change! I do feel that perhaps £22 for a T-shirt is a bit much but I love the detail on this top and I love how it stands out. Plus Topshop give you 10% discount so I suppose it’s not all bad. I love how it’s just a simple tee that will go with almost anything in my wardrobe over the Spring and Summer months. Another first for me – an item of yellow clothing! I fell in love with the colour and pattern of this skirt, again all I need to say is florals! I can’t wait to style this in different ways and wear it without tights in the warmer weather. I own a skirt similar to this from H&M last year and I love the detail of the buttons down the front it’s something so simple yet super pretty. We’re pretty sure that won’t be the only clothes we buy this season so look out for more haul posts!